James Ellis was responsible for one of the incarnations of the oldest business in the Junction, the Peacock Hotel. The tavern was established some time in the late 1820’s or early 1830’s. It was outside the Peacock Hotel that rebel leader William Lyon Mackenzie, possibly aided by the Peacock’s owner James Farr and probably 40-50 men, robbed the Royal Mail in the aftermath of his march down Yonge Street in the 1837 Upper Canada Rebellion. The proceeds of the robbery helped Mackenzie to escape to exile in the United States. James Farr disappeared some time after the rebellion, if not before, history is vague. 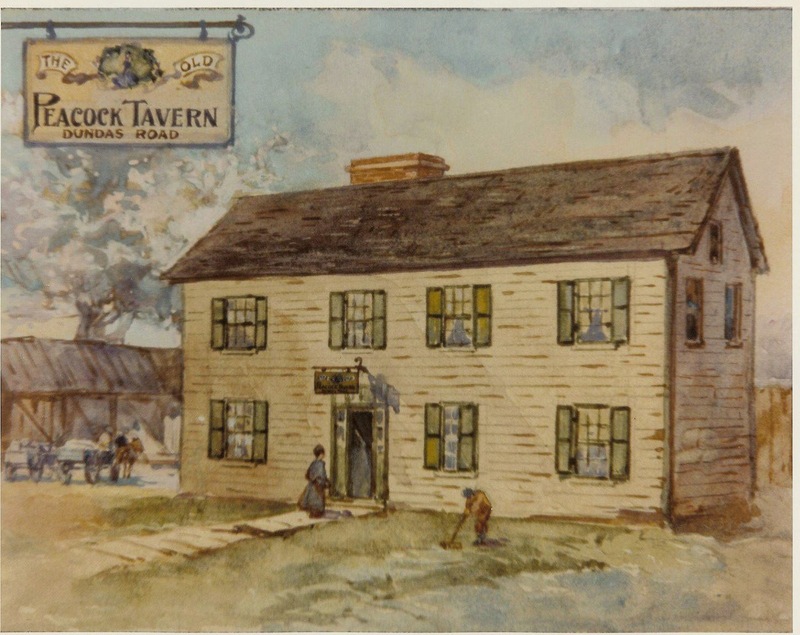 His wife and family own and operated the tavern until 1875 when they sold it to John Colley. There is a suggestion that a farmer’s market was held outside the tavern from the earliest times. Later owners Daniel Blea and Alex Purse continued the practice and oganized pigeon shoots in the area. It was said “a wonderful meal could be had for a quarter” at the Peacock. 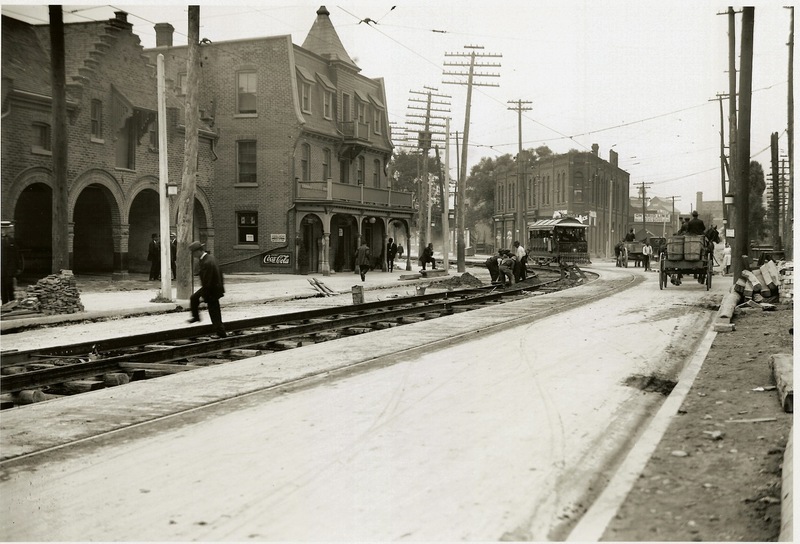 Francis Watt purchased the tavern just in time for it to be shut down when the Junction closed its bars in 1904. By 1907 it was a boarding house. The original building was demolished in 1925. The hotel is a three storey structure with the architectural interest concentrated in the front facade. The overall appearance of french influences with the mansard third storey, the slightly arched window heads of the second storey and the full width porch lend an air of rural/small town to the building. A simple exercise in symmetry, with a central point of interest in the projecting bay (B) at the third storey surmounted with a pyramidal roof and emphasized by the projecting balcony at the third floor. The central element is flanked by identical areas of wall (A) – giving a ABA rhythym to the facade for the upper storeys. The broad porch at the ground level provides shelter from the elements and welcomes guests to the hotel. The four columns express a AAA structural rhythym at odds with the uppers storeys. The building’s side walls are meant to face or abut their neighbours, hence the forward extension of the brick at the eave line of the mansard style third storey. This is usually seen in a zero-lot-line situation to protect the wooden structure from fire exposure and vice versa for their neighbours. The existence of windows in the end wall facing the camera suggests there is a narrow alley between the main hotel and the stables. The stepped parapet as seen in the wall opposite the hotel’s windows reinforces the evidence of separate structures. The stable building is clearly purpose build as a stable which makes the architectural detail of the structure more noteworthy. This is a glorification of the horse, carriage and by extension the act of travel and of the traveller. If it was late in the day, why not stop over at this hotel because in addition to a good meal, you would know your horse was being well cared for. Another exercise in symmetry, again with a central element, the large stepped gable, showing dutch influences married to four grand romanesque revival arches. The level of architectural detailing is above the level of those of the hotel proper.